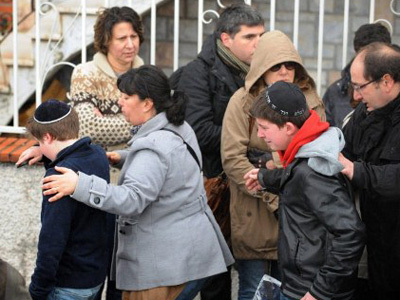 The Toulouse gunman suspected of murdering seven people, including three children at a Jewish school, remains barricaded in his house. 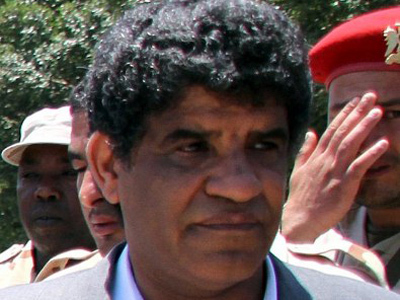 He admits to the killings and has agreed to surrender "late this evening," according to the French prosecutor. Prosecutor Francois Molins admitted that the initial raid on the suspect house had been a failure. The gunman opened the door and began firing at police, who were saved by their bullet-proof vests. "He said he does not have a suicidal spirit, he did not have a martyr's soul, he preferred to kill and remain alive," Molins said, as cited by AFP. Earlier, BFM TV reported that Mohammad Merah, 23, had been arrested during a raid on his home. Both the interior minister, Claude Guéant, and Toulouse deputy mayor, Jean-Pierre Havrin, have denied that the suspect has been arrested. Mohammed Merah had been preparing another shooting on Wednesday, and was planning to kill another soldier, the French prosecutor said. He added that the suspect had been trained in Waziristan in north-western Pakistan. Speaking to an Israeli radio station right-wing French presidential candidate Marine Le Pen drew attention to what she stressed was the issue of the underestimated threat of Islamic fundamentalism in France. “The discovery of the killer only confirms what I have denounced for years: the development of Islamic fundamentalism in our country, which is underestimated by public powers," Le Figaro newspaper has quoted her as saying. Merah, who is armed with a Kalashnikov and Uzi automatic pistol, has been surrounded by police for more than 16 hours. 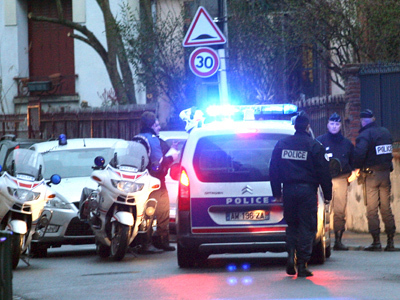 Three police officers were wounded in the dawn raid on the apartment. Police claim they want to take him alive so he can be brought to justice, but they insist they will storm the building should he refuse to surrender. Several hours after the initial raid, the suspect exchanged one of his guns for a cell phone to hold talks with police. The same Colt 45 handgun was used in all the attacks and in each case the gunman was driving a Yamaha scooter with his face hidden by a motorcycle helmet. More weapons had been found in the suspect's car. ­The suspect is a French national of Algerian descent, who is believed to have connections with Al-Qaeda. This person is also thought to be behind the killing of three French soldiers of North African origin last week. Merah told police on the phone he had two reasons for shooting each of his seven victims: “to take revenge for Palestinian children killed in the Middle East” and “to attack the French army because of its foreign interventions." He also confirmed his connections with Al-Qaeda, Interior Minister Claude Gueant said. "He explained how he had received instructions from Al-Qaeda during his stay in Pakistan, how he had even been suggested to carry out a suicide mission but refused, though he agreed to carry out a general mission to commit an attack in France," AFP quoted Gueant as saying. The suspect's mother, his brother and his companion were detained for questioning, a judicial official told Associated Press on condition of anonymity. According to Prosecutor Francois Molins, Merah’s brother was involved in a terrorist network that sent militants to Iraq. Meanwhile, President Sarkozy visited the funeral service at Montauban Barracks to pay tribute to the victims of last week’s killings. In his speech, Sarkozy said the three soldiers were victims of a "terrorist execution." French authorities have been concerned with a problem of home-grown terrorism, watching this problem develop for more than a decade, journalist and author Barry Lando told RT. “There are probably now hundreds of young men possibly women also in France, of Macrobian background a lot of them, but who are French citizens, who may have been to Afghanistan, Pakistan, and who may hold similar beliefs,” Lando said. Before the recent events, Merah had been tracked for several years by the intelligence service, but "nothing that might give rise to suspicions that he was preparing a criminal act was ever apparent," the French Interior Ministry said. ­“You have hundreds if not thousands of people who could be potentially dangerous in France. So you have to choose which are the most dangerous. It seems that this man was not targeted as very dangerous. This was a mistake,” Claude Moniquet, director of the European Strategic Intelligence and Security Centre, told RT. ­The parliamentary leader of Belgium's Vlaams Belang Party, Gerolf Annemans, believes that the EU should adopt stricter rules for granting citizenship unless the existing Muslim communities in Europe distance themselves from radicals such as Mohammed Merah. “We can already have some conclusions, for instance that Western Europe has been too flexible in affording citizenship to people that are not real citizens,” he told RT.